William DOWLING may have been b. c1821, London, England, son of _______ and __________ . This information is not proven, looking for proof of parents names & birth place, parents not recorded on his marriage or death certificate. Another unproven story is..... "William travelled to Australia with his brother (name unknown) and they parted company after a "falling out" either on arrival or en route apparently due to the fact that William was becoming a Protestant due to his marriage to Mary Jane." William DOWLING of Ballangeich, near Warrnambool, S-W Victoria was married on 3 Nov 1851 at Ballangeich, Victoria to Jane BEST of Ballangeich, Victoria, b. 1832, Dorset, England, daughter of Charles BEST and Maria COUSINS. Witnesses to their marriage were John McKELLAR and Donald McPHERSON both of Ballangeich. William & Jane had children at Warrnambool, Harrow and "Runnymede" Station, near Sandford, Victoria from 1855-1873. The family appears to have moved to Dartmoor by 1880, when a son John, aged 18y was drowned in the Glenelg River after his canoe capsized. Jane DOWLING died in hospital at Melbourne in 1894 and was buried in the St Kilda Cemetery. William DOWLING died in the Hamilton Hospital in 1897 and was buried in the Hamilton Cemetery. Arthur George DOWLING b. 1857, Warrnambool, S-W Victoria, d. 1864, Mocamboro, near Merino, S-W Victoria. "Portland Guardian" (Vic.) Thursday, 9th September 1880. (Obituary) The Casterton News reports several deaths by drowning :--On Friday, the 27th inst., two brothers named Dowling attempted to cross the Glenelg near Dartmoor, in a canoe. Before they had proceeded very far the canoe capsized, and one of them, John Dowling, aged 18 years was drowned. The body has not yet been recovered. "The Border Watch" (Mount Gambier, SA) Wednesday, 24th May 1871. Mr. Sprigg, the Coroner at Casterton, held on inquest on Monday week, on the body of a child named Lucy Dowling, two years and four months old, who had died early that morning under somewhat peculiar circumstances. Two days previous to its death the child had been seized with pains in its stomach, and taken to Dr. Shrapnel, who prescribed for it. The child, however, got worse, and died shortly after midnight. The cause of death being mysterious, an inquest was held, and Dr. Shrapnel performed a post-mortem examination, and he arrived at the conclusion that the cause of death was some irritant vegetable poison. The mother, in her evidence, stated that the only thing the child could have taken was gum. She knew the child had eaten some gum, but she had no idea there was any harm in it. The doctor said that the appearance of the intestines and stomach were such as to indicate that gum had been eaten. The jury thought that the question as to whether gum was or was not a poison was so important that at their request the Coroner stated he would send down the stomach and its contents to the Government Analyst, in order that the nature of the poison which had caused the child's death should be distinctly ascertained. The inquest was accordingly adjourned.-Albion. According to a descendant this tree is connected to the DOWLING family (Photo - Tarja Fellowes). "The tree photo is taken at Dartmoor in 1935 at the time of a Dartmoor School Reunion. 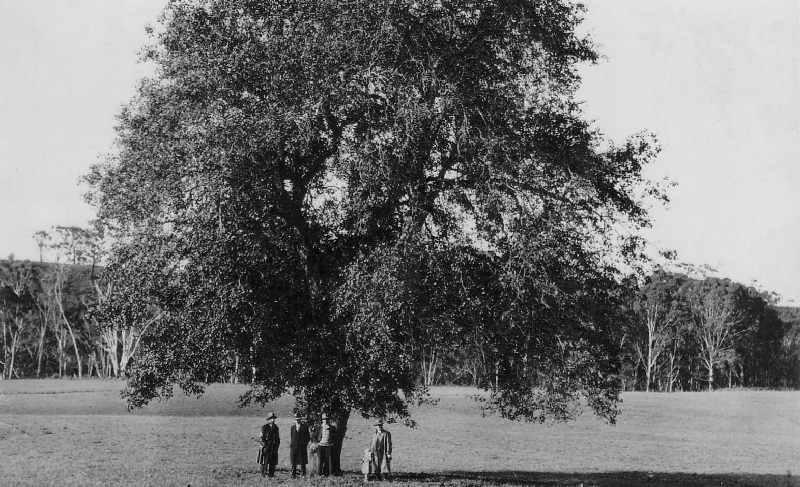 The tree is a pear tree on the river flat allotment block first purchased by George Greenham Snr, and where he settled in a slab hut he built in 1857. The tree was then 45 feet high and aged about 70 years. Presumably the men are Greenham descendants/relatives but are not identified."